An Iraqi looks at the ruins of Grand al-Nuri Mosque and al-Hadba minaret in the destroyed Old City of Mosul, Iraq, Aug. 5, 2017. Abu Ghazi stood smoking a cigarette outside what used to be his home in Mosul's Old City, where only the sound of the footsteps of a few soldiers on patrol and twisted pieces of metal and fabric flapping in the wind disturb the eerie silence. "They should just bulldoze the whole thing and start over," he said, gazing at the rows of collapsed buildings with their contents strewn across the upturned streets. "There's no saving it now, not like this." Hundreds of yards away on Wednesday, Federal Police shot an Islamic State fighter as he emerged firing his gun from an underground tunnel on Makkawi Street. An Iraqi man is seen reflected in a cafe window in the destroyed Old City of Mosul, Iraq, Aug. 7, 2017. 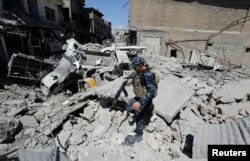 "West Mosul is still a military zone as the search operations are ongoing for suspects, mines and explosive devices," a military spokesman said. "The area is still not safe for the population to return." However, in nearby Dawrat al Hammameel, with machines whirring in his workshop, Raad Abdelaziz said he has encouraged neighbors to return despite the still very real danger weeks after the government declared victory over the jihadists. Just this week, his nephew, Ali, saw a militant emerge from under a house and try to injure some civilians before he was caught and handed over to the Federal Police. But Abdelaziz, whose factory was up and running just two weeks after he returned to Mosul with his family, persists: "We want people in the neighborhood to come back to their jobs." He is already filling orders for water and gas tanks from residents intent on rebuilding. "Life is already coming back gradually," he said. Like Abu Ghazi and Raad Abdelaziz, dozens of those displaced by the fighting have returned to West Mosul, which saw some of the fiercest fighting in the nine-month battle to rout the militants from their stronghold in Iraq's second-largest city. A member of Iraqi federal police patrols in the destroyed Old City of Mosul, Iraq, Aug. 7, 2017. At the northern pontoon, one of two remaining access points between East and West Mosul, hundreds walked toward the western half of the city, carrying suitcases, household goods and livestock. Others drove across the makeshift bridge in overflowing coaches. Ziad al Chaichi came back to reopen his tea shop in West Mosul a week ago, having fled his nearby home in March. "Everything's still a mess — we have nothing. No water, no electricity — we need the essentials," he said in his shop where dainty porcelain teapots hung from the walls. He was thankful that some people were buying his tea, including Abdelfattah, a neighbor who sat with a group of men outside. "We want life to return here," said Abdelfattah, 60, who came back to a partially collapsed home with his family about three weeks ago. "Not for us — the older generation — but for the children. ... Until then, we're just sitting here patiently, drinking tea." Even in death, the militants haunt Mosul's residents. A handful of their bodies are lying around the Old City, a pungent reminder of the last 10 months. An Iraqi man distributes tea for people at a cafe in the destroyed Old City of Mosul, Iraq, Aug. 7, 2017. "We wish they would just take them away," said Najm Abdelrazaq. But unlike with civilian bodies, the police and the military refuse to allow it, he said. "Why should we dignify them and remove the bodies?" one soldier said, when asked why the bodies were being left to rot in the 47-degree Celsius (116 Fahrenheit) heat. "Let them rot in the streets of Mosul after what they did here." Returnees are concerned about the smell and the risk of disease, but they'd rather have the bodies of their neighbors recovered first. Around the corner from Chaichi's shop, scrawled across several collapsed houses in blue ink was: "The bodies of families lie here under the rubble."